Get your gas masks and eye wash ready for this weekend’s IndyCar incursion into Portland, as a mass of particulate matter may make even murkier an already muddled mix. Our special prognostication this week involves fanning the flames by pointing out just how pure and unspoiled our predictions have been. Since achieving absolute accuracy in Detroit, we’ve picked the winning team the last two races, if not driver. We correctly called both Barber and Phoenix earlier this season. That’s not including all the picks we’ve gotten partially right either, or nailing last year’s championship – which no one else on the planet did. From now on, we predict you’ll pay closer attention to our remarkably unspoiled prognostications. Pole sitter for Sunday’s race’ll be Will “He ever grow up?” Power, much to our – and every other sane race fan’s – chagrin. Barring historic flooding or, more likely nowadays, wildfires destroying the entire area, he’ll be P1 for the fourth time this season. Since in reality neither natural disaster is likely to occur, it’ll be Sour Grapes again leading the field to another sub-standard start. When’s the last time the series piss tested that guy, anyway? Penske pared back, Ganassi got leaner, Rahal redoubled and Foyt became even less relevant. Perhaps the greatest concern – apart from the second rate schedule – is the car count for 2018. After yet another IndyCar title thanks to Josef Newgarden’s pivotal piloting, Penske’s crew will consist of only three cars for the first time since 2014. At 42 the ever popular Helio Castro-Neves finally has been put out to pasture, where presumably he can climb all the fences he wishes. The formidable trio of Pags, Power and Newkid will carry the Cap’n’s colors in the upcoming campaign, easily remaining the odds on favorites nearly every weekend. 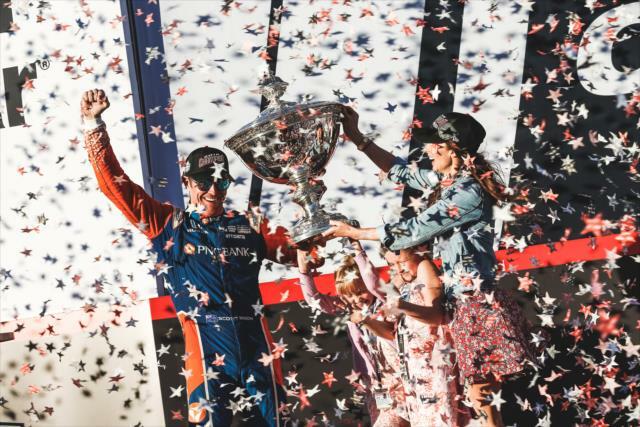 Alexander Rossi owes a highly dubious second career win to his teammate and fellow Indy 500 winner Takuma “timing is everything” Sato, who committed the racing equivalent of hari kari at the Glen – twice. In NBCSN’s booth, apparently Townsend Bell was under the influence of enough meds to nearly forget his name, which makes us wonder about his urine test for the next race. For Daffy Leigh Diffey‘s triumphant return to IndyCar there was the ridiculous wet start that wasn’t. That is to say, it wasn’t wet and it wasn’t much of a start. 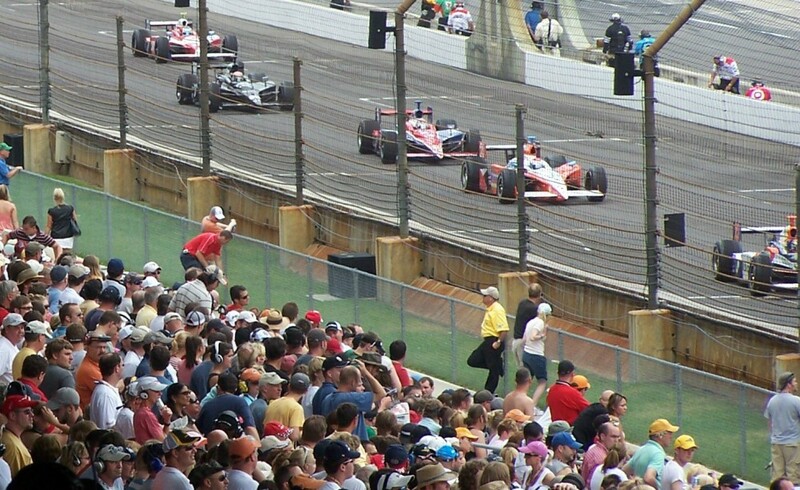 Thank goodness Tony Kanaan made it through the parade laps this time, though he would eventually find pit lane too difficult to navigate, hitting the wall at pit lane exit – right after the championship leader did the exact same thing. The start saw Josef Newgarden surging, Scott Dixon dropping and Helio going way wide with no track restrictions in place. After the first lap pit stops for slicks a reshuffle had Helio around Rossi for the lead and Ryan Hunter-Reay up to fourth. Spencer Pigot spun completely around on lap 4 but managed to keep it going and even lead some laps before finishing 12th. On lap 5 Dixon got around RHR prior to the first of three cautions, as Hinchcliff’s gear box issue and a puff of smoke from his Honda ended his day. The race returned to green on lap nine and as usual Helio jumped the restart ahead of Rossi, Newgarden and Dixie. Dixon soon passed Newkid again and appeared to be on the way to another win at the Glen. However, it wasn’t to be and Helio opened up a sizable lead. Expect real estate – and points – to change hands fast this Sunday at the Glen. Our special prediction for the race is so much fuel saving and strategizing that you’ll think methanol allotments are the good leads from “Glengarry Glen Ross.” Frankly, we’ve never understood why that film’s so highly regarded by some – and feel precisely the same way about Watkins Glen. Like the movie, last year’s last minute return to upstate New York was a snoozer – and not just because of the steady stream of paid Verizon plugs uttered by drivers, either. Scott Dixon ran away with it – enjoying a 16 second margin of victory – at a road course so similar to Mid-Ohio it’s beyond redundant. Did we mention it’s very much like the worst course on the schedule yet? Speaking of leads, pole sitter Will Power sure blew one last Saturday night, didn’t he? Oh well, at least he didn’t crash on the parade lap. Instead of picking Power again for his seventh pole of the campaign however, we’re going with Dixon. He won from pole last year over Josef Newgarden – sound familiar? – and excels on unwatchable permanent road courses like few others. It’ll only be Dixie’s second P1 award of the season, which with only a single win has been as disappointing as Alan Arkin’s paltry performance.